Tracing the range of the Andes – the geographical and cultural spine of South America – Peru, Bolivia & Ecuador are born of a synthesis of ancient America and medieval Europe. Footprint’s Peru, Bolivia & Ecuador Handbook will guide you from the blinding white salt crusts of Salar de Uyuni, through the awe-inspiring citadel of Machu Picchu, to the bustling colonial treasure trove that is Quito. · Great coverage of the top activities and sights in the region, including following Darwin’s footsteps in the Galápagos; spectacular costumed festivals; sacred pyramids and temples; the mystical Lake Titicaca. From the astounding Colca Canyon to a melée of indigenous markets, Footprint’s fully updated 4th edition will help you navigate this breathtaking destination. Born and raised in Ecuador (Quito and Riobamba), Daisy Isacovici's pet peeve is being mistaken for a gringa. Robert Kunstaetter hails from Montreal, where Daisy attended university. Soon after they met in 1979, he suggested travelling in South America for 'a year or so', and they have yet to turn back. Over the years and miles, Robert and Daisy became regular correspondents for Footprint, contributing to the South American Handbook and other Latin American titles. 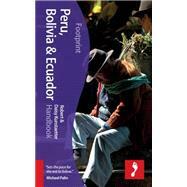 Based back in Ecuador since 1993, they are authors of Footprint's Ecuador & Galapagos Handbook. They also travel frequently to Peru and Bolivia. After all these years, Robert and Daisy still have difficulty distinguishing between work and play.